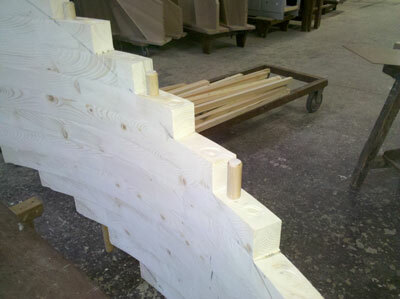 Morel and Sons is a small family stair building business that is about an hours drive from my workshop. 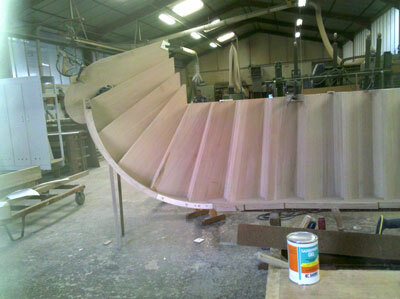 They have a big CNC machine and make traditional stairs to very high standards. I’ve often asked them to machine parts for me and have always been very satisfied with the quality of the parts they delivered. 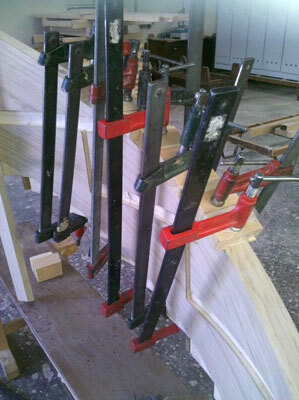 Although they make great stairs they had very little experience in making curved parts. 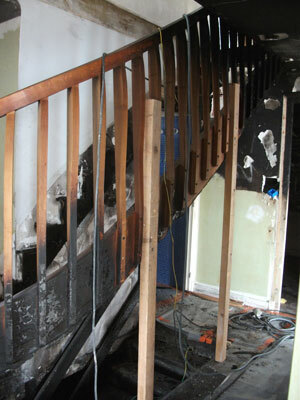 Last year Jean Marc Morel the director contacted me to ask my advice on how to build a curved staircase to replace a stair that had been damaged in a fire. 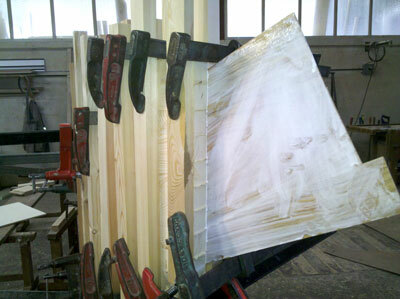 I suggested that he try out my horizontal laminated technique and I gave him a couple of links to my website and videos. I completely forgot about the project until I went back to see them earlier on this year. Chatting to Jean Marc he said casually that he had made the curved stair and showed me the photos. This was the first time that Jean Marc and his team had used this technique and using only the information on our web site he has made an amazing job of a very complex project. 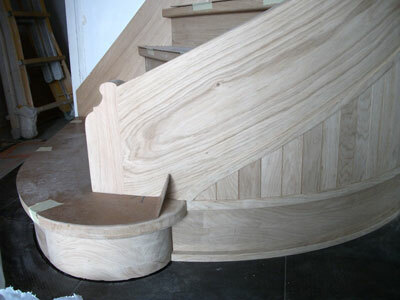 This is a great example of how simple and effective this technique is for making complex shaped stairs. 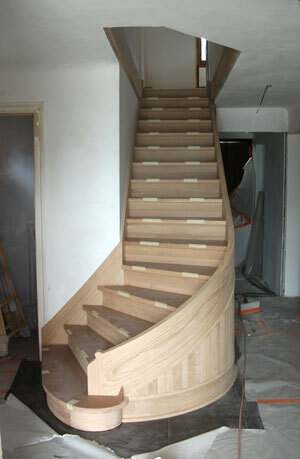 Please sign up for Wood Designer Premium Support if you’d like to learn more about how to build curved stairs yourself. based on that, I’m asking your kind guidance If there is a regular design magazine which I can Subscript in it so that they can support and supply me with all new designs it will be highly appreciated sir. Design is a vast subject. There are thousands of design magazines that you can read. One online magazine that you can subscribe to is Houzz. 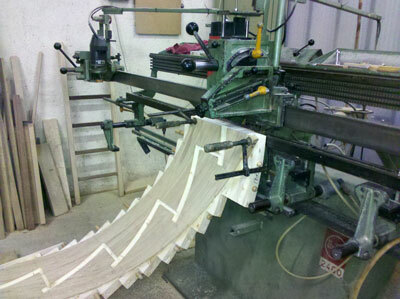 With the internet finding design ideas is too easy the problem for a manufacturer is more what do I want to design for? So,as a manufacturer, what are my objectives and which design styles will help me towards my objectives? 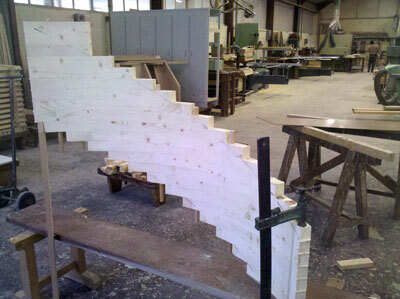 Triple your orders with StairDesigner!